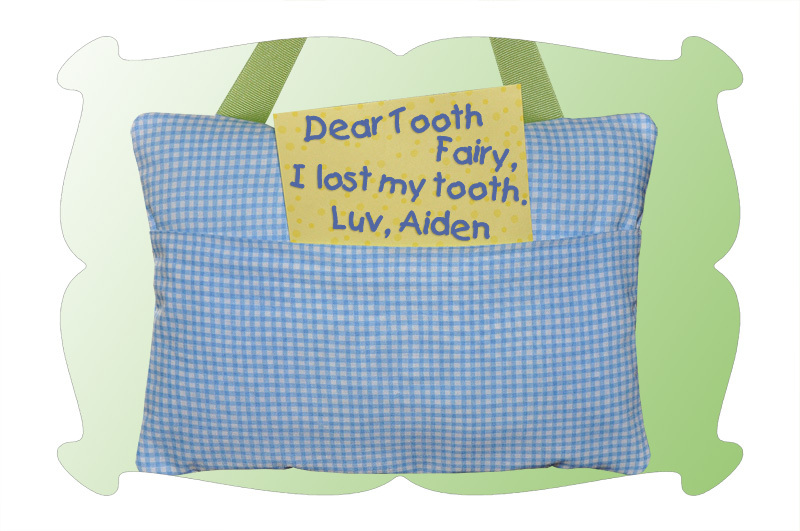 Our Tooth Fairy Pillow features a Tooth Fairy applique and a special little pocket (on the front) for safe keeping his little tooth...or money from the Tooth Fairy. Made in the hoop, in just one hooping, with no additional sewing to do. Made in the hoop, in just one hooping, with no additional sewing to do! ...or money from the Tooth Fairy. 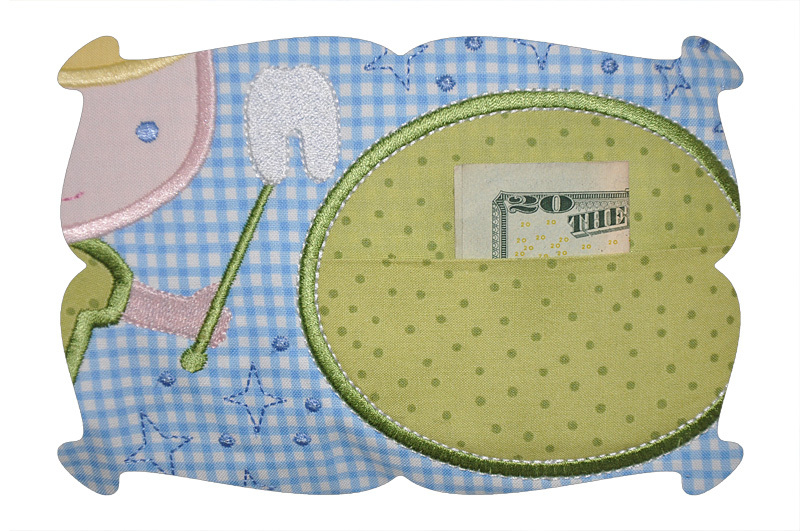 On the back is a pocket so your little one can leave a note to the Tooth Fairy. The optional ribbon handle makes for convenient hanging on a door knob or bed post. Complete step by step PDF instructions with how to photos included! Please note: The font shown (the name Aiden) is available as a separate purchase. Please see the Related products tab: Natalie Embroidery Font. Instructions are included on how to add a name to the pillow. 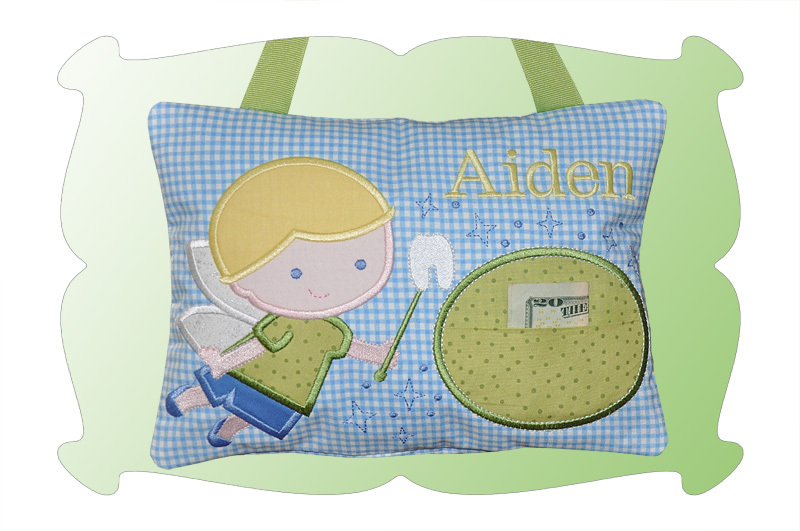 The Tooth Fairy Pillow in the hoop comes in 4 hoop sizes: 5x7, 6x10, 7x12, 8x12. All sizes are included with your purchase! 5x7: 5.00 x 6.98. SC: 13,668. 6x10: 5.90 x 8.23. SC: 16,410. 7x12: 6.70 x 9.35. SC: 18,364. 8x12: 7.70 x 10.74. SC: 21,138. Depending on which size design you are making (the larger sizes take longer to stitch), I'd say this is a project that can be completed within 45 minutes to an hour.